Stay active this summer at Snozone! Children between 5 years and 15 years are consuming media online for around 15 hours per week, according to Ofcom’s report on Children & Parents. Even younger children (aged 3- 4) are spending more than 8 hours a week online. Although studying online can have great educational benefits, it isn’t beneficial to children’s health and wellbeing to spend so much time online. During the holidays and weekends, set aside time to get out of the house and burn off some energy doing a sport or physical activity you can all enjoy as a family. 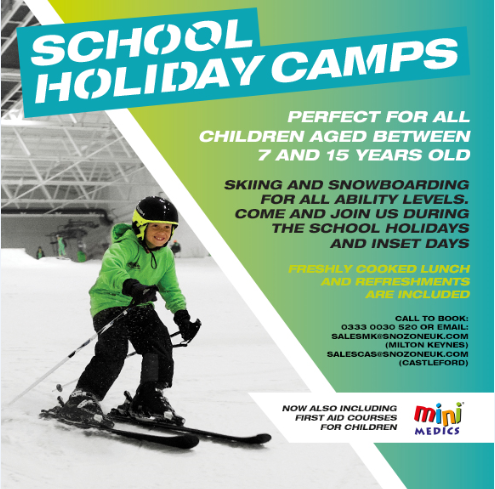 We offer skiing and sledging to those 3 years and above, and snowboarding to 7 years and older. Sledging starts from only £9.99 and all of our snow activities are guaranteed to get the heart pumping! As adults it’s easy to just exercise at the gym but this summer get moving with the children in your life and do something new. The key to staying fit as a family is to make sure that you all enjoy it, for some it helps if you don’t necessarily realise you’re exercising. Ask your children how they feel afterwards and they’ll start connecting that feel good rush of endorphins with physical activity so they’ll want to do more! The summer holidays are seen as a time to relax but without stimulation children can soon become sluggish and demotivated. Getting involved in sports, especially learning new ones, is the most common way of boosting physical activity and encourages better concentration and increased energy. Choose a sport you can all do together and enjoy some much needed family time together such as skiing or snowboarding. Check out the Snozone webpages for offers on family lessons and sessions available this summer. School may be finished for summer but why not arrange a play date with your children’s friends and their parents to keep your children active. Many play groups close over the school summer holidays so get together to enjoy sledging, SnoPlay or the indoor soft play to avoid boredom! The UK saw some high temperatures last month and summer is not yet over. When the temperature rises there’s nothing more refreshing than a crisp -3 degrees, real snow and the adrenaline rush of snowsports. There are activities for everyone and if you think summer isn’t for snow – think again. It’s the best time to visit with fresh snow, no lift queues and special promotions. The British summer is renowned for its humidity which can leave us hot, sticky and uncomfortable. The body sweats to try to cool us down but when that isn’t effective, it can lead to more serious heat exhaustion where water, salt and chemicals that our bodies need are lost. When the temperatures rise get some welcome relief where temperatures stay a cool -3 degrees all year round! If you’re a regular gym user you can improve your ski or snowboard performance through increasing your strength but keeping your weight steady. Boosting muscle mass can add to the stress caused to muscles, bones & ligaments through snowsports. Focus on yoga, cycling, climbing or lift lighter weights with more repetitions. Exercises where you use your own bodyweight are also ideal although not as ideal as hitting the indoor slopes over summer! The best way to work the muscles used in snowsports activity is to spend time on the snow. Miles under your ski’s or snowboard will not only improve your technique, ability and experience but will also get you fit. If you have any questions please do not hesitate to give us a call on 0333 0030 520. Skiing in the summer and snowboarding in the summer are great ways to improve your skiing or improve your snowboarding! The slopes are quieter and you can really prepare for the peak season through good quality practice and training. We look forward to seeing you on the slopes!